March 15 – March 17. Omar explains that he may tell a few lies, but at least they will be interesting. Omar tells us ‘I have been giving island tours for years and this will be the biggest yet’. We are the first on the bus, sitting behind him so we will be able to hear everything. Parked here in the dirt road, by the trail head, near the northern dinghy beach, we chat with Omar until the rest of the cruisers arrive. Omar spent most of his youth in Nassau and chose to come back to Long Island where he SCUBA dives, does police work, leads tours, plays Junkanoo drums, and represents the island in body building competitions. Omar is a friendly force of nature. The rest of the sailors arrive. Most are participants of a rally race that brought part of the Georgetown party scene eastward for a few days. The group wants to learn more about the island, but also wants Long Islanders to remember we were here. This trip is a great deal for us. It is much easier to explore the isle by road than by boat. Two school buses are noisily loaded, and we’re off to see the attractions of southern Long Island. On the way we learn some things about the local culture. 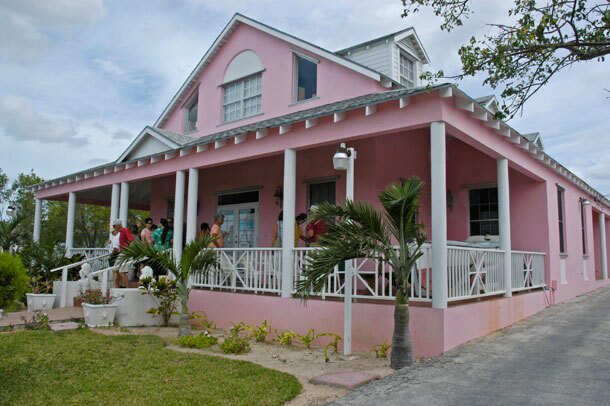 Much of the land here is ‘Generational Land’ granted by the crown to Bahamian families 200 years ago. Many descendants of the original grantees have disputes among themselves about how the properties have been split up over the years. Suppose, like Omar, you come back to the island and put some money into restoring an old abandoned building. Be careful. Some of your long lost cousins may decide to lay claim to your improved property. There may be family disagreements here, but there is little crime. The last big crime was a bank robbery during regatta some years back. This being an island, the robber fled by boat. Our very own Omar selected the finest vessel in the harbor, commandeered it in the name of the Queen, chased down the perp, and brought him to justice. The only real crime these days is Drunk and Disorderly. We ride past the police chief’s house. At 10:00 AM his car is still in the yard. We pass an old unused jail. The last prisoner there sobered up, poked a hole in the roof, climbed out, and rode his bike home. The tour takes us through communities with family names: Piners, Pratts, Bowers, Grays. 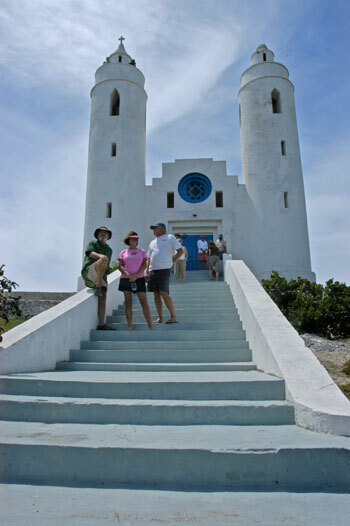 We see old churches, Dean’s Blue Hole, and Clarencetown. Our bus stops back by a tiki bar. 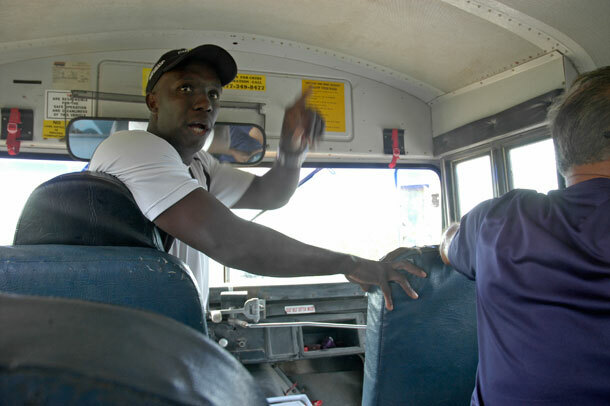 The other bus driver is persuaded to stop at a liquor store. Long Island’s oldest church, built in 1800’s. The folks on this island are very religious, but there are two liquor stores for every church. At the museum the office of tourism set up a ‘bush tea’ tasting for us. In the days when there were few doctors in the Bahamas, people relied on herbal cures. We sampled some. 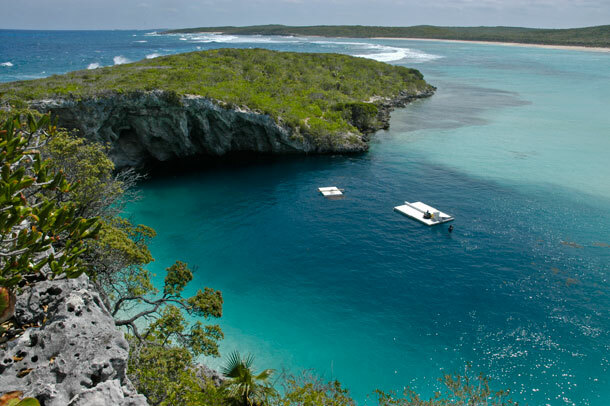 At 695 feet, Dean’s Blue Hole (foreground) is the world’s deepest. A free diver practices by the platform in the center. These divers use special breathing techniques, including swallowing a stomache-full of air before descending. After 60′ they just glide down. They often black out. Part of holding a free dive record includes being able to answer simple questions after surfacing. 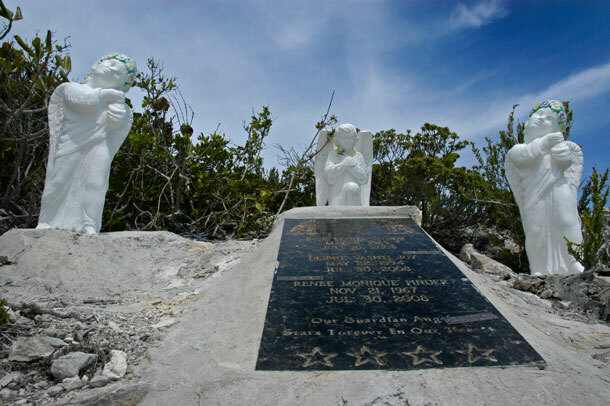 Tribute at Dean’s Blue Hole to three drowning victims. Our tour guide Omar put on his SCUBA gear and dove to recover the bodies. Looking down at our bus from the cliff over Dean’s Blue Hole. Lunchtime’s over and tour organizer Rockin’ Ron is about to blow his whistle. 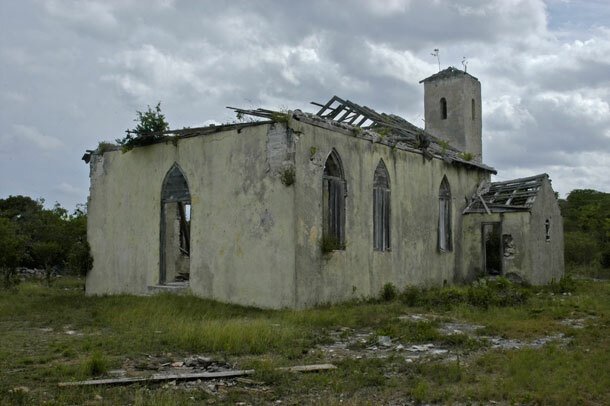 Church in Clarencetown built by Father Jerome. 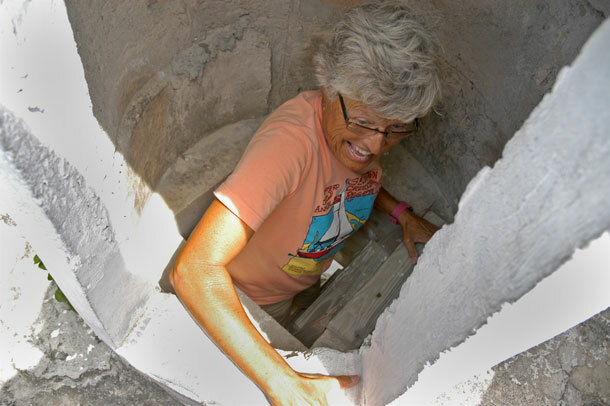 Inside one of the two turrets at the church in Clarencetown. It is said that the preacher won’t marry a couple if the bride is too wide to squeeze through here. 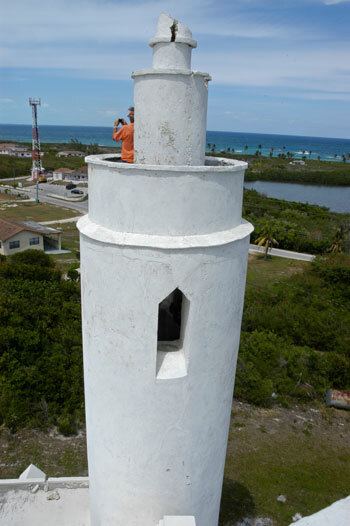 View of one turret from the top of the other. 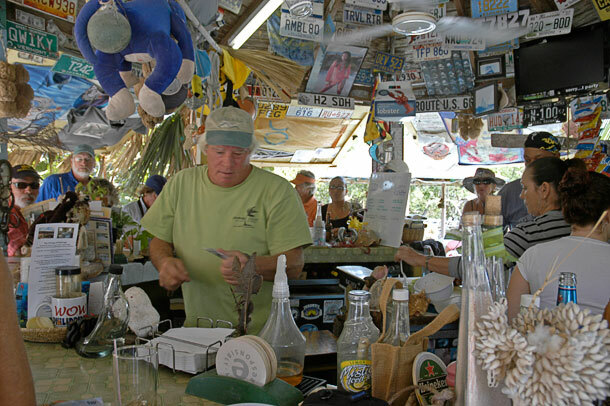 Last stop on our tour was the Conch Shack. 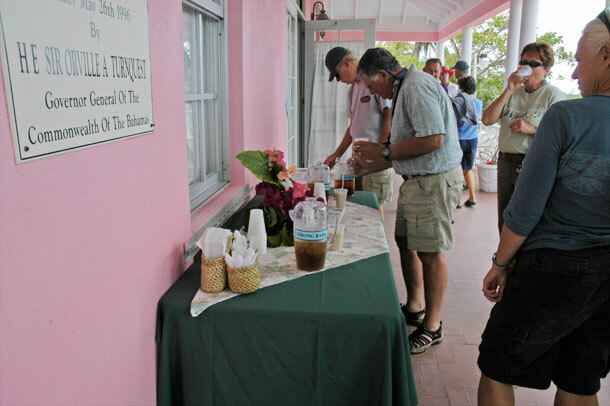 The tour ends early enough to allow everyone to freshen up back at their boats before happy hour at Island Breeze. Not us. Our boat is too far away. Instead we chat with new arrivals Eric and Gale, whom we met at Farmer’s Cay. We also learn more about lobster fishing from resident Danny Knowles. Then it’s time for the Friday night happy hour jam session. The jam is a blast. The sun sets. The cleverly arranged songs have all been performed. The free diving kids we saw practicing earlier at Dean’s Blue Hole have brought up the lyrics for ‘Boy Named Sue’ on a laptop and belt the song out as Ken and I accompany them. It’s probably time to go. 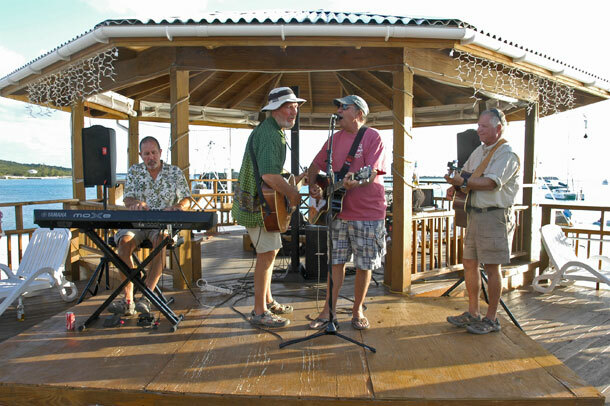 Ken, Greg, Ted, and Chris crank up happy hour at Island Breeze. Ken can play anything. Ted has a really nice repertoire, and Chris is a real rocker. A serious song? Must be a request. We leave the instruments and start the long walk home. A few cars pass and one turns back to pick us up. James and Sherry of Whale Head Point (and Alabama) drop us off at the trail head to dinghy beach and we promise to look them up when we come back next season. Saturday is volunteer work day for the hurricane damaged regatta center. By late morning Duwan and I gather our tools and make our way back south. We pick up the instruments, walk over to the center and start work. We clean up, scrape paint, hammer nails and paint roof joists as a new metal roof is put on. Around noon beers are passed out. Everyone gets to know his work buddies a little better. I’m working with John, who lives up by dinghy beach, and with the island’s patriarch of wooden race boat building. He’s seventy-five years old but looks about forty. Many of the sailors in the rally group are having a race this afternoon. There will be a big awards ceremony with a Junkanoo band. We just can’t have another late night, though. Mid-afternoon we gather our stuff and start the hike back toward the boat. We don’t get far before another worker stops to give us a ride. He takes us as far as Sou’ Side. As he drops us off he yells to Tyrone that we’ve worked hard and deserve a beer. Just after leaving Sou’ Side we run into our buddies Don and Patty from Silents Wings. After a little arm twisting they take us right back to the stools we just left. We barely make it back to the boat by dark. On Sunday we wake at the crack of ten to a much emptier harbor. 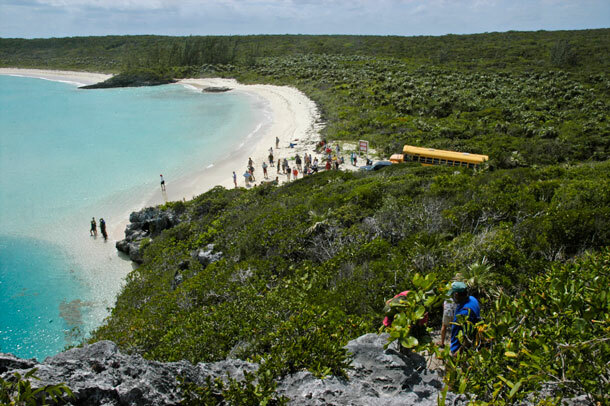 Everyone has left for choice anchorages at Hog Cay and Calabash Bay. We manage to sail ten miles to a rolly anchorage at Simms. We rest up from the big weekend resolving to come back next year and hitchhike up and down the isle until we know everyone here. Tomorrow we head for Conception. 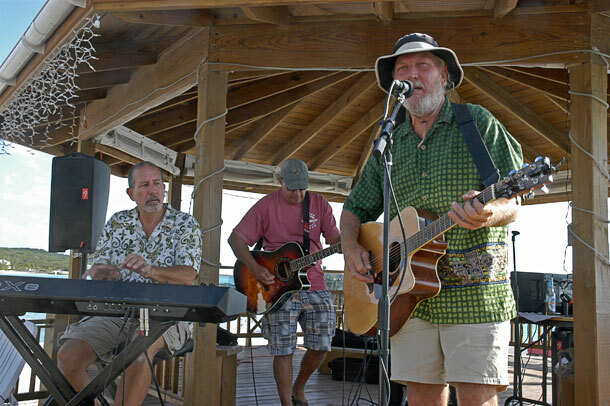 This entry was posted in Life on the Water, Long Island, The Bahamas and tagged Sailing Friends. Bookmark the permalink. We have had snow flurries yesterday and today in C’town!! Missing you all. So sorry! I will stop complaining about how cold it is here. See you soon when it is warmer! Sounds like a lot of fun! I’m intrigued by the blue holes! Am I correct that divers are doing this dive with no scuba equipment? How far down can they dive with only holding their breath? Sounds like a death wish to me. Thanks for the updates!